[Spectre Admin] – No photo today, but I managed to find this one, sent a couple of days ago, of Leo and Jean having a really good laugh! I think you’ve hit on the secret to success, and that’s why you’re succeeding!!! “Being safe, having a laugh and having an adventure”, in that order. We could all do with living our lives like that, you could write two books on your return, epic adventure and applied Existentialism. Love it!!! Sorry to read there s no wind but pleased you are able to give your bodies a rest as they have been punished so much the last few weeks. Just make the most of it, as it will be all over soon and just a memory, with a fantastic movie. Cheers Glenda Down Under. We’ll all get parkas, belay pants and balaclavas to the 4DMax premiere. Your California family is following you – and “Grandma” has the Manhattans ready when you return! 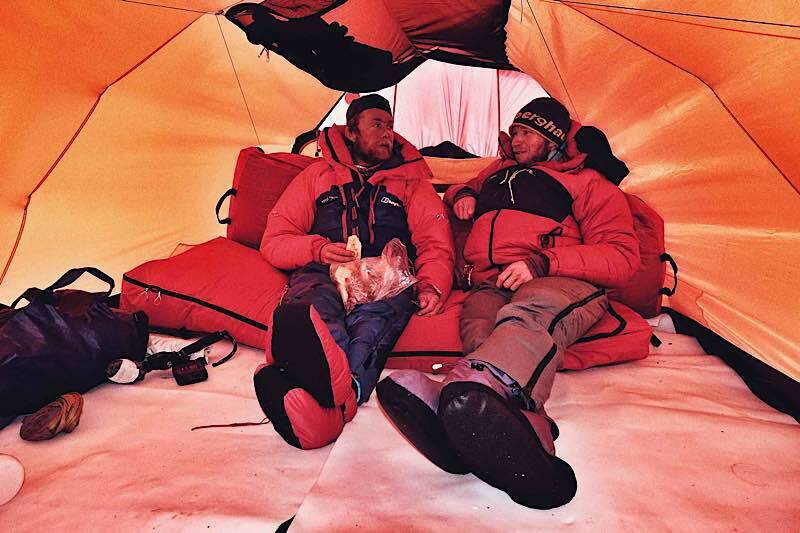 Remembering the New Year’s Day photo of you and Sean (AKA Stanley) toasting with frozen champagne in The Last Great Climb expedition to Antarctica. Bitter sweet. Be safe – of course!